Whisk 2 Tbsp. chives, crème fraîche (if using), and eggs in a large bowl. Melt butter in a large heavy nonstick skillet over medium-low heat. Add egg mixture and season with salt and pepper. Cook, occasionally scraping bottom of skillet with a heatproof spatula to form large, soft curds, until just barely set, 3-4 minutes. Set aside. Place 2 slices toast on each plate. Put avocado into a bowl, mash with a fork, and season with lemon juice, salt, and pepper. Spread mashed avocado over each slice of toast. Spoon eggs over avocado. 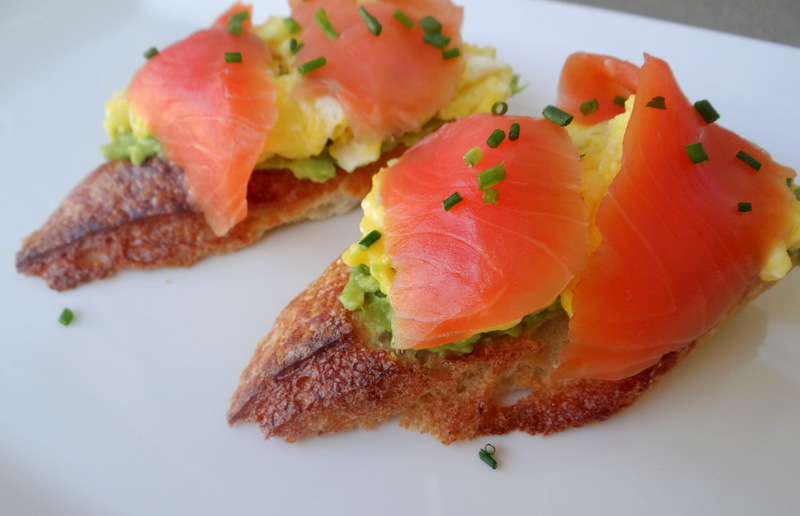 Drape salmon slices over eggs, garnish with remaining 1 Tbsp. chives, and season to taste with pepper.